The Revolutionary War Overnight on the grounds of Colonial Chesterfield at Riley’s Farm combines our popular day time Revolutionary War Adventure with an evening of living history fun in our recreation of a New England farmstead from the 18th century. During your stay, you can expect plenty of authentic characters, great food, fun activities and contests with delicious prizes! A typical journey begins in the evening at 5:00 PM when guests are assigned a cot in their sleeping quarters, take part in an orientation meeting and are then divided into groups called “townships.” Students then undergo martial training as well as a few additional activities not usually featured on our day trips. 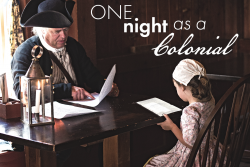 After a enjoying a full meal accompanied by live 18th century music in our Hawkshead Public House, guests will be paid an inspirational visit by the legendary Patrick Henry, while rounding out the evening with apple crisp! Cabins and marquis tents will typically house weary guests as they slumber soundly in preparation for a very full day! At dawn, overnighters explore some of the farm’s vast 760 acres by reconnoitering the top of a local hill and standing watch for the British army. After skirmishing with the redcoats, guests will return to the tavern to enjoy a farm breakfast of eggs, bacon, french toast casserole and orange juice. By the time breakfast is over, games and last minute preparation will be a welcome respite before the day’s Revolutionary War Adventure! Participate in extended martial drilling time learning advanced skills and maneuvers for the battle to come! Participate in competitions against your fellow militiamen to display your ability as a soldier. Learn the craftsmanship of an eighteenth century villager as to try your hand at dipping candles or writing letters with a quill pen. Enjoy a fine feast of Sally Lunn bread, candied carrots, mash potatoes, and roast beast served within the Hawk’s Head Tavern. The atmosphere comes alive as you partake of your meal while being serenaded by live musicians playing period tunes. The Tavern is known to have visitors congregate to, even Mr. Patrick Henry himself has been seen to frequent the area and educate the patrons by way of his speech, “Give Me Liberty or Give me Death”. Experience the sleeping quarters of the eighteenth century within marque tents. Make certain you have a warm bedroll in the bundle of your accoutrements, it is known to be cold in the mountains. Mount up and move out as we march about the various trails that weave around the mountains on our 760 acre countryside. Be forewarned, it is best to take up your musket and prepare for an encounter with the British Infantry that parade the grounds. Enjoy an amazing breakfast of eggs, bacon, and french-toast pudding within the tavern. Afterward, partake of some leisure time of games on our town green just prior to the day tour’s beginning. Groups can be a maximum of 112 people. Most schools bring lunches for the students, and they will be given a picnicking area for lunch. This tour is geared towards 5th graders, but is fun for all ages, young and old.